Sweet dreams are made of chickpeas. With no plans to return to Santa Monica anytime soon, I needed to find a way to bring this chickpea curry into my life. Luckily for me (for all of us! ), Chef Bryant Ng shared his recipe online. I just needed to adapt the dish from restaurant to home kitchen without sacrificing its flavor or integrity. 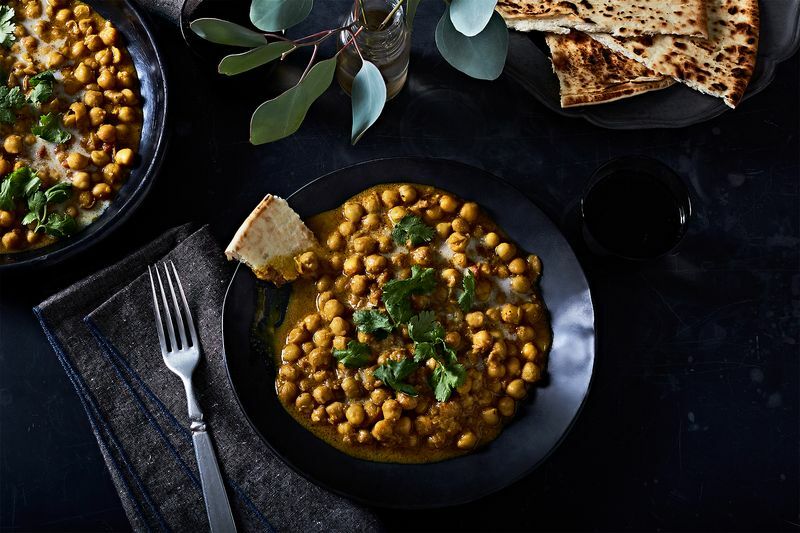 The original dish uses dried chickpeas, soaked overnight, and then slowly simmered in coconut milk for several hours until tender. I turned to canned chickpeas, probably my most beloved pantry ingredient of all time, as a time saver. In addition to canned beans, I streamlined the steps and removed a few ingredients that can be harder to find, like pandan leaves and annatto oil. To add back some of that flavor, I used a small amount of fish sauce to boost the curry’s complexity. From there, I only simmered the chickpeas and curry for about 20 minutes until it was thick and creamy. But the most important thing I learned? Resist the temptation to add more—tender slices of chicken or pork, charred green beans, cubes of grilled summer squash, slivers of sweet peppers. Even if it’s peak summer and you have them on hand! I went this direction in my testing but quickly came back to just chickpeas, standing confidently on their own in the thick, creamy curry. Other additions only distract. My homemade version has already become a favorite dinner in my house. This year, my 8-year-old son requested this curry with warm, buttered naan for his birthday dinner. I love the dish so much, I’d happily eat it for my own. Of course, if you’re anywhere near Cassia, go order the chickpea curry. But if you’re thousands of miles away like me, stock your pantry so you can make this version whenever the mood strikes. For weekend celebrations or yourself on a Tuesday night. What’s your best pantry-cleaning dinner? Share your favorites in the comments below!